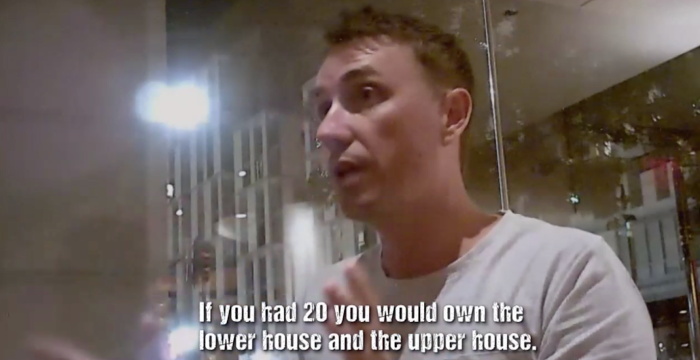 James Ashby and Steve Dickson were secretly recorded during a trip to Washington DC. Source: ABC/Al-Jazeera -How To Sell A Massacre. Shocking footage set to air on ABC tonight shows One Nation Chief of Staff James Ashby and Queensland leader Steve Dickson meeting with officials from the National Rifle Association of America (NRA) and other pro-gun groups in an attempt to land cash donations of up to US$20 million (AU$28 million) for Pauline Hanson’s One Nation party. One Nation have so far declined to comment on the documentary. Source: Al-Jazeera/How to Sell A A Massacre. Muller contacted Ashby and used his links with pro-gun groups in America to arrange a meeting with the political party, having already rubbed shoulders with senior gun lobbyists in the US and even Donald Trump Jr. In return, Ashby allegedly promised to loosen Australia’s anti-gun laws. Ashby is then seen greeting Muller at the NRA headquarters Washington DC alongside Dickson who says he dreams of changing Australia’s laws regarding weapons. In the footage, Ashby also suggests his aims in meeting the NRA are to ask the group “to rally their supporters within Australia”, adding “I’d love to get my hands on their software … [and] if they can help us with donations, super”. The documentary comes just weeks after the devastating terror attack in Christchurch, New Zealand, which saw NZ Prime Minister Jacinda Ardern tighten the country’s gun laws. Ardern’s decision to toughen her country’s laws is similar to that take by former Australian Prime Minister John Howard who restricted gun ownership following the devastating incident at Port Arthur, Tasmania, in 1996, when Martin Bryant used an AR-15 to gun down and murder 35 people, with a further 23 injured. The documentary is also explosive due to Hanson’s previous backing of laws to restrict foreign political donations, which were passed and came into effect on January 1 this year. According to The Guardian, Hanson told a Senate debate that “overseas money should not have an influence on our political scene” and foreign donations “should be totally stopped”. Starts at 60 has contacted One Nation for comment. Watch the two-part Al Jazeera investigation at 8:00pm today and Thursday on ABC TV and on iview. What are your thoughts on this story? Will you be watching How to Sell A Massacre tonight?